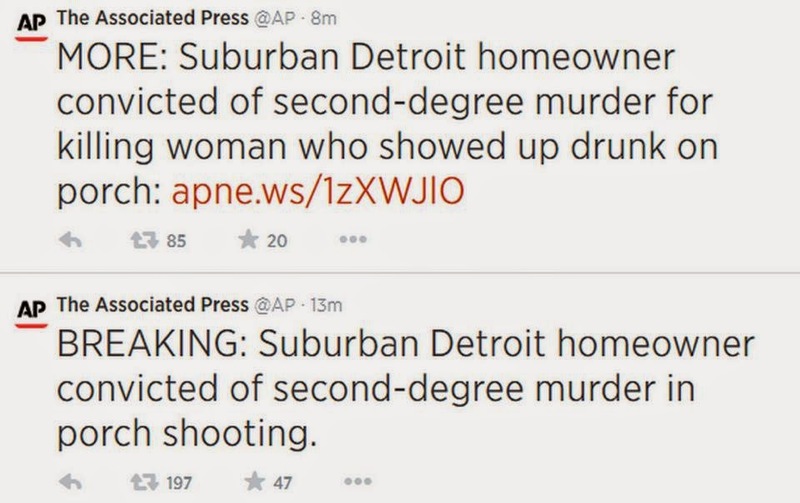 Renisha McBride was more than the “woman who showed up drunk on porch.” But that’s the way The Associated Press referred to her yesterday after a man was convicted of fatally shooting her. But Black Twitter did not miss the original tweet and immediately took AP to task for its portrayal of the unarmed 19-year-old black woman who knocked on the door of a white man, Theodore Wafer, after she reportedly crashed her car. McBride as a homicide victim who was responsible for her own death. Black Twitter applied that shift in responsibility to other historic and contemporary examples of injustices against black Americans with the hashtag #APHeadlines. Here's a collection of some of those tweets. The social media response to the McBride tweet crushed the old one-way letter to the editor model of communication with editors. Readers, in real time, let the AP know that its words to describe the justice reached in the McBride case were an injustice. Communities of color often lament negative news coverage they receive. The way the media reports on the background of black crime victims is often criticized. Reports showed that McBride had alcohol and marijuana in her system at the time of her death. But are those facts that needed to be included in a breaking-news tweet about the verdict? No. The AP’s insensitive wording about the McBride verdict is very important because it is one of the few national media organizations to report on the trial with any significance. There were mentions of the verdict yesterday on national newscasts and websites. But the Wafer/McBride verdict was not a priority among national news outlets. The fact is, black women and the violence committed against us is rarely a top news story. In 2011 after Anthony Sowell was convicted of killing 11 black women in Cleveland that story barely made it through one national news cycle. Producers and editors were too preoccupied with the cases of defendants Casey Anthony and Amanda Knox. Even when they’re the defendants, white women get more media attention than black women crime victims. 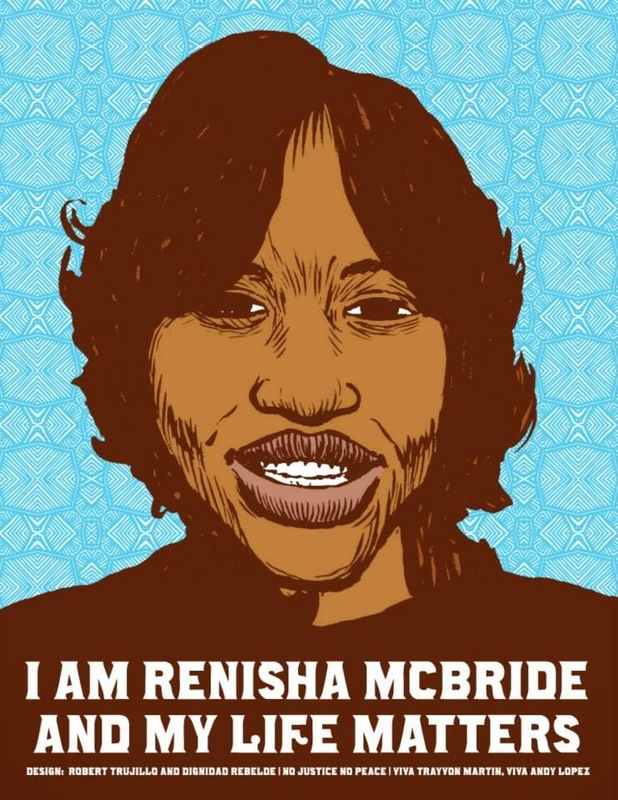 Renisha McBride didn’t get much national mainstream media coverage after she was fatally shot or during her murder trial. When black women’s pain is in the news it is devalued and belittled. 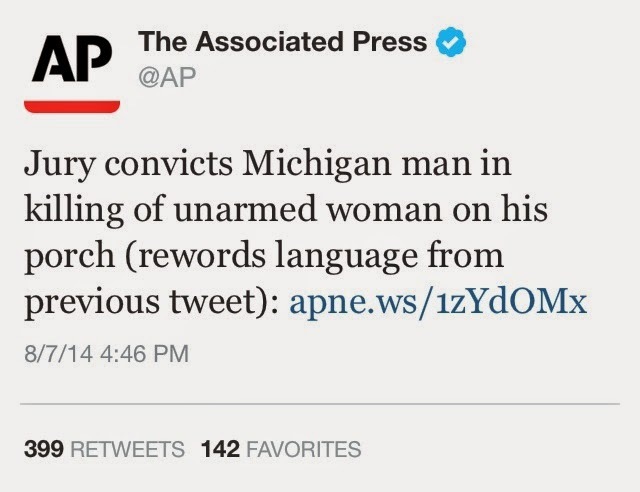 The AP tweet is an example. But activists kept McBride’s story alive through social media. I first learned of her death from a Facebook update from my cousin who lives in Detroit. Then I saw the #JusticeForRenisha and #RememberRenisha hashtags on Twitter. Social media has empowered communities of color to be their own media agenda setters and gatekeepers and bypass traditional mainstream media outlets to get their messages to the masses. That’s a good thing. But social media has also put more pressure on journalists to get information out even faster than ever before. There is little time for journalists to think much about what they’re doing. The rush to be first also increases the possibility to be wrong. Social media magnifies and amplifies journalists’ mistakes in a way we’ve never seen before. However, journalists have to find a way to step back and think about what they’re doing before they send a message to millions of followers who are ready to retweet or refute their updates. A former journalist friend told me about #APHeadlines. She wondered if more diversity in AP newsrooms and on its social media desk would have prevented the unnecessary tweet about McBride. I don’t know. But it is clear that diversity in mainstream newsrooms has taken a strong hit in recent years. Just last week the Pew Research Center reported that there’s been a loss of almost 1,200 black journalists in daily newspaper newsrooms from 1997 to 2013. There is no question that racial diversity is important in newsrooms and contributes to more accurate and complex portrayals of people of color. But there is no guarantee that journalists of color would work on or even be consulted on editorial issues regarding race. I know several black journalists who were consulted after newsroom editors and producers committed grave racial editorial errors. This time it was AP. Next time it'll be another mainstream media outlet that will make a mistake that will put a dent in its credibility. Perhaps others will learn from the AP’s mistake. If they don’t Black Twitter will bring it to their attention. The tweets is watchin'. And I'm SO glad they are.